In the past year, I've had the opportunity to write essays on different films that are playing at The Brattle Theatre. My two most recent ones include Disoriented Drives: Intimacy and Distance in Hitchcock's Vertigo and Monster in the Celluloid Closet: Historical Re-Presentation in Gods and Monsters. This time around I got to write about something that I was utterly excited about: puppets! Some of you know, I recently came on the Board of Directors at Puppet Showplace Theater in Brookline and therefore, the opportunity to write something about puppets was clearly gonna happen, right? I have to say, I really REALLY enjoyed writing about this. The Dark Crystal rivals only The Never-Ending Story in my head in terms of fantasy films that influenced and emotionally struck me as a kid. There was just so much going on and I was so moved by the story and the puppetry that I have long returned to think about and watch it. So getting to write about the film and the ways it struck me was such an enjoyable process. Equally as important, I've found that I'm finding my knack in writing these essays (at least for me, my editor there might feel otherwise and I wouldn't blame her!). I've often wondered how people who write long critiques of art can do so and yet, here I find it increasingly easier to draw out the themes, flavors, and styles that strike me within a given film (or two, in this case). So I hope you'll enjoy this one! "At the height of his fame, Jim Henson delivered two films that deviated from his renowned Muppets and Fraggle Rock franchises. The Dark Crystal (1982) and Labyrinth (1986) hint at where Henson could have taken puppetry had he lived longer. They represent the best of Henson’s fantasy world-building, beautifully crafted scenery, and, mastery of the puppet arts. More than thirty years later, revisiting these films produces two insights. The self-evident one is that they withstand the test of time; still heavy, haunting, and Homeric in the case of The Dark Crystal, while Labyrinth remains charged, comical, and campy. The lesser realized truth is that both films are hallmarks of a storytelling that sought to strike a balance between adult and child audiences, challenging adult notions about certain forms of entertainment." 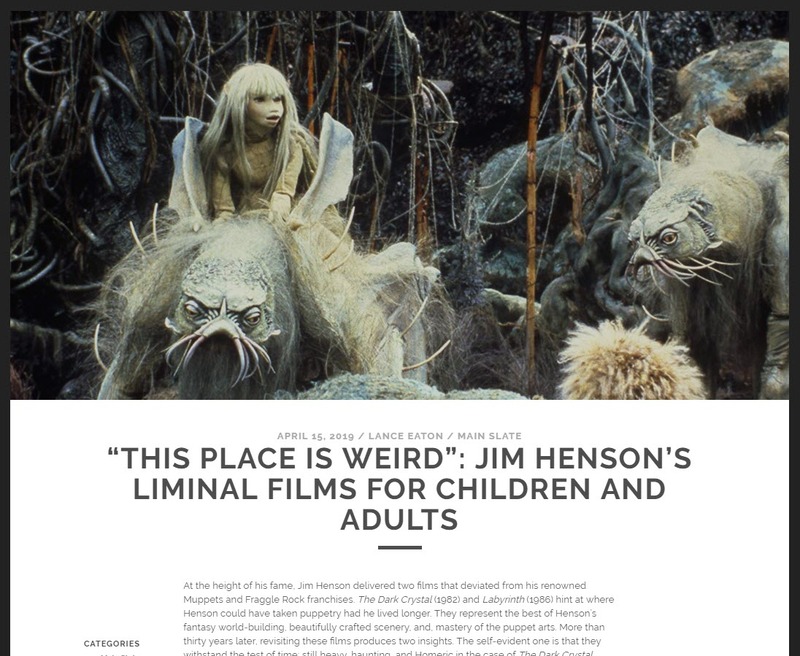 Read the entire essay on the Brattle Notes blog: "This place is weird": Jim Henson's Liminal Films for Children and Adults.